New research on the health impacts of outdoor air pollution suggests that it is responsible for more than 3m premature deaths around the world each year and that this number could double by 2050. The study, published in Nature, looks at how the major sources of air pollutants, including traffic, industry, agriculture and domestic sources contribute to pollution levels in different parts of the world and estimates their associated impacts on mortality through heart and lung diseases. Unsurprisingly, the greatest effects were found in rapidly developing, heavily populated countries such as China and India. Despite large increases in industrial production, energy generation and vehicle traffic, the study identifies domestic and commercial energy use associated with heating and cooking as the biggest contributor to the high toll from outdoor air pollution in these regions. China suffers the most, accounting for more than 40% of air pollution-related deaths worldwide – more than 1.3m each year. The country’s large population, intensive agriculture and heavy industrialisation mean that economic development has come at a high environmental cost. Major cities such as Beijing have experienced rapid deterioration in air quality associated with economic growth and the changing lifestyles of an expanding urban middle class. Traditional paper fans have long since been replaced by air conditioning as the preferred means of keeping cool in summer. At the turn of the century Beijing had one million vehicles; now, it has more than five times as many, bringing exhaust fumes and gridlocked streets. Towering new high-rise apartments are hidden from view behind a pollutant haze that turns the sky white and forces citizens to don protective face masks. Ordinary Chinese citizens are well aware of the problem. Environmental issues top the list of major public concerns and are a popular topic for online discussion. Air quality is monitored on a continuous basis at more than 1,000 sites nationwide, and a host of popular mobile phone apps stream live data on air pollution levels on an hourly basis. Acknowledging the problem has been a big step forward, but addressing it without damaging economic growth presents a major headache. 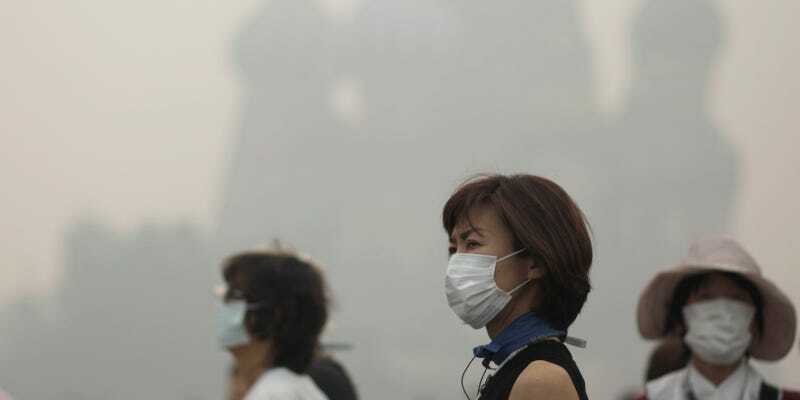 Beijing’s geography means that its air quality can be particularly bad. Pollution from factories, farms and homes right across the vast and fertile North China Plain – the country’s traditional economic heart – is trapped by southerly winds against the mountains that surround the city to the north and west. Pollutants pool over the region, combining to form a haze that extends over hundreds of kilometres, appearing in satellite images as a murky blanket hiding the ground. The Chinese government, keen to present the city’s best face to the world, imposed strict air pollution controls during the summer Olympics in 2008, for the APEC forum last autumn, and most recently for a military parade to mark the end of World War II. On each occasion the haze vanished – a clear demonstration of what can be achieved. But the long-term changes needed to make this blue sky an everyday occurrence require greater effort. Plans are underway to relocate polluting industries, move to cleaner energy generation and tighten enforcement of environmental regulations. Beijing steelworks was moved out of the city into neighbouring Hebei province before the Olympics; now other manufacturing industries are following suit. New, cleaner and more efficient facilities will reduce the sources of pollution and shift them downwind of the city. However, with a population of more than 100m and producing a quarter of China’s steel, Hebei already has major air pollution challenges of its own – and its pollution controls are less strict than in the capital. A shift in power generation from coal to gas is also underway, bringing benefits for climate as well as air quality. China currently leads the world in renewable energy production, with its huge investments in solar, wind and hydropower. These make up only 10% of the country’s energy needs, but are expected to rise to 16% by 2020. These large infrastructure changes are the key to controlling and reducing air pollution, but residential and agricultural sources must now be addressed, too, to bring the blue sky back. However, the balance between economic development and environmental protection is starting to shift, much as it did in the West half a century ago. The new policies now being put in place will put China on a cleaner trajectory than the one assumed in the new Nature study. The authors of the study are right to highlight the human costs of air pollution, and to warn of the future dangers of “business as usual” development. But in China now there is a new desire for clearer air that will put the nation on a different path – and reduce the heavy toll of air pollution-related deaths. Oliver Wild is a Reader in Atmospheric Science at Lancaster University.